tallbikewidecountry | in which the author documents his newfound insanity, meets some interesting people and works on his tan. The hard way. tallbikewidecountry in which the author documents his newfound insanity, meets some interesting people and works on his tan. The hard way. 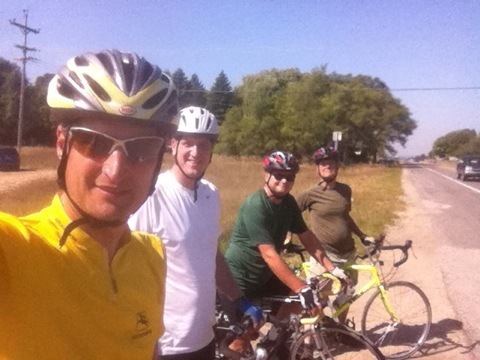 My youngest brother has joined us for the 75 miles from Traverse City to Petoskey, so there are now four of us riding together, our own little peleton! We enjoyed the sauna at the hotel last night, followed by several pints a piece with dinner, so we’re moving a little slow through today’s heat, but it’s nice to have company. I can’t believe the end of this five week cycling adventure is almost over! 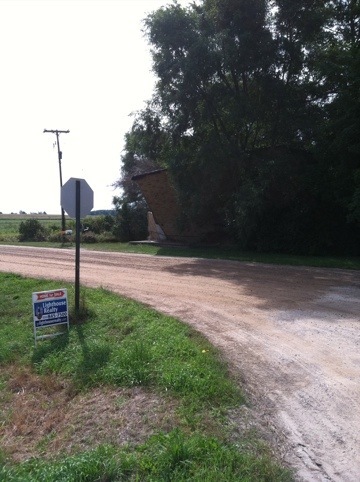 Lovely house, at a quiet crossroads, some minor structural issues. Price reduced! The town of Hart, Michigan was home hast night. It has a bunch on incongruities: there’s a Mexican restaurant (that doesn’t serve alcohol), a Korean war plane next to the lake downtown, and a Swedish bakery. That was, of course, the site for breakfast. 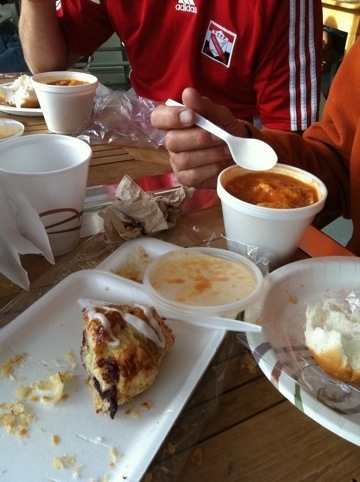 Two coffee cakes later, of was time to hit the road, and work off some sugar. We’re in Holland, Michigan this evening. Today’s ride was mostly up the Blue Star highway, which is a moderately well travelled route, which only sometimes has a shoulder. The best parts of the day were when we got off that route onto backspace. We had lunch in New Haven, which not only had a bikestore where my brother cod buy the gloves he’s been missing, but also a nice Mexican restaurant. Instead of an afternoon milkshake, we indulged in one of the many fruit stands along the way, and had fresh peaches and blueberries. Five miles from Holland State Park’s campsite, I heard the same sound my front tire made just outside of Lewiston, Montana: my reactors had blown. This time, however it was because I had worn out the tread. 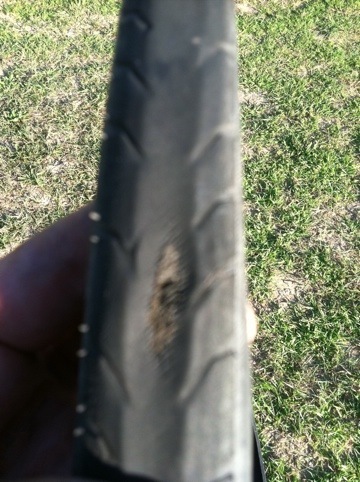 Perhaps 2250 miles of cross country riding was all I should have expected from a wheel! Last time this happened, I borrowed a tire from Alex. This time, I had the spare I had picked up in Minot, and was back on the road in 15 minutes. I’m hoping tomorrow doesn’t involve more mechanical difficulties, and that the promised tailwind appears. Riding into a north wind for two days has gotten old. The first day of riding in Michigan was full of adventure. Jonathan’s rear pannier showed a propensity for popping off when he would accidentally kick it with his foot. We eventually had to strap them down with bungie cords. My dad’s pannier popped of at another point, and just to make the problems universal, my front derailleur picked today to break. Luckily the coast of Michigan is pretty flat, and I can make due with the 9 gears on my back wheel until a new shifter can be found. About 4PM we were flagged down by John, a teacher and avid cyclist in St. Joseph, who plied us with cold drinks, tales, and then hopped on his bike to guide us toward out hotel for the night. 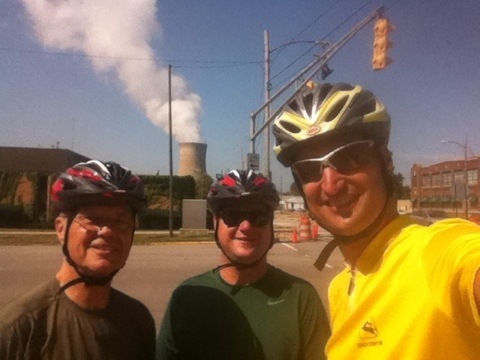 The good characters that pop out of the woodwork to help cyclists exist in Michigan as well. My overnight in chicago had gone smoothly: i found mh bike in the basement of union station after my train ride, and successfully put it back together next to another cyclist from Minneapolis. Lodging and food were equally easy to deal with. I made it to millennium station in plenty of time for my South Shore train to Michigan City, only to find that the South Shore was doing weekend construction, and was terminating all trains west of Michigan City. Ok, I can ride from the last stop. But then the conductor pointed out that although bikes are allowed on all other Metra trains, they are prohibited on the South Shore. Drat! 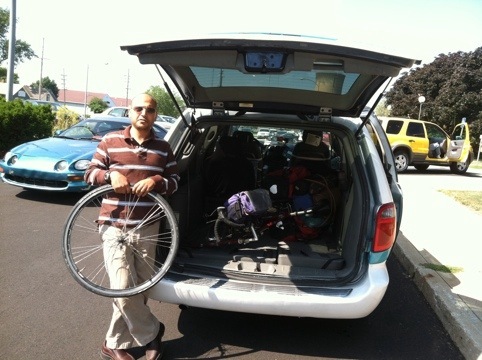 A phone call to Amtrak confirmed that bikes aren’t allowed on their trains to Michigan City. Another call showed that greyhound doesn’t run to Michigan City. My dad and brother were waiting there already, so there was one solution: take a cab. I think everyone needs one super expensive cab ride story they can tell, and now I have mine. I enjoyed every minute of it. The cab got me to Indiana only a few minutes after the train would have arrived. The Michigan adventure begins! My serendipitous traveling companion for the past three weeks has been Alex Rice, RAGBRI veteran, francophile, lover of Indian food, adventurer, fellow prime number aficionado, and all around good egg. 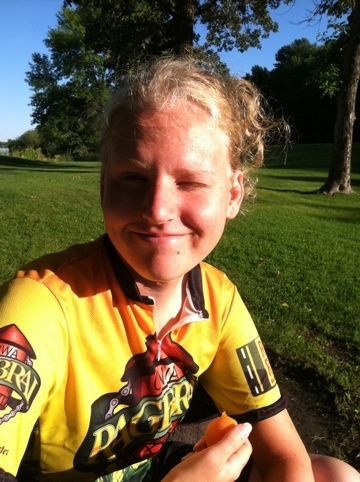 Our paths crossed in Ft. Benton, and we both altered our itineraries a bit to enjoy each other’s company longer, but now our adventures go separate routes: she’s finishing her cross-country ride, while I skip ahead to Michigan. I couldn’t have asked for or chosen a more compatible riding companion. You can follow her ongoing exploits at RideAlexRide.blogspot.com, although her updates might be a little more sparse than they were without the use of my iPhone.